Become a Healthy Penn State Ambassador! Are you passionate about health and wellness? Maybe you’ve recently decided to make your health a priority and are amazed at how much your life has improved. Maybe you want to encourage other students to be healthy. 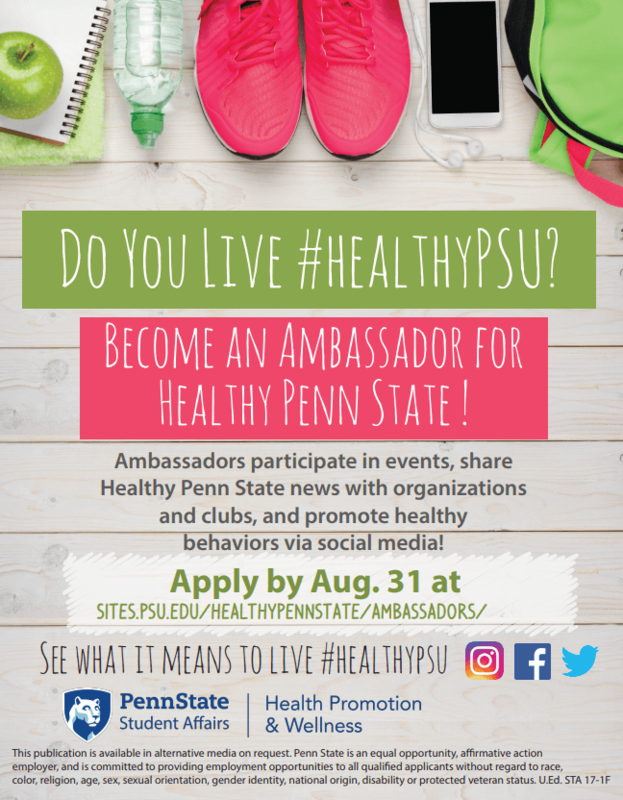 Wherever you are in your health journey, consider applying to become a Healthy Penn State Ambassador! Healthy Penn State Ambassadors serve as role models for healthy behaviors on campus. They participate in outreach events for Health Promotion and Wellness (HPW) as well as promote health through social media and informal interactions with other students. Ambassadors also speak to groups, clubs, and student organizations about the HPW Wellness Services and how students can use the services to improve their health. As a Healthy Penn State Ambassador, you will work with health promotion staff while developing your leadership skills and enhancing your resume. You will build valuable friendships and expand your professional network, all while making a difference in the health of Penn State students. Training to become an ambassador will take place in Fall 2018. The training consists of 8 hours and will be held at times that are most convenient for the selected students. Students will learn healthy skills, health promotion strategies and motivational interviewing. You must be able to commit to at least one semester to be a Healthy Penn State Ambassador. Requirements include attending the mandatory 8-hour training, 1 hour bi-weekly meetings and volunteering 1 to 3 hours per week (at most) to Healthy Penn State activities. To apply, complete the application at here. The deadline to apply is August 31. If you have questions, stop by Health Promotion and Wellness in 20 Intramural Building or call (814)-863-0461. You may also contact us by e-mail at promotinghealth@psu.edu.